Very impressed to see the range of gluten free sweet treats at Benesse Cafe. 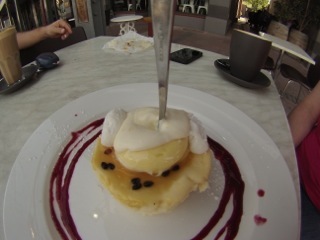 I gave the passionfruit baked cheesecake a try and it was yummy and the coffee is excellent as well. Nothing to do with being gluten free but would like to add that my son Kyle who is 12 took this awesome photo with great perspective with his new birthday gift a Go Pro camera! We took a drive out to the Ferguson Valley yesterday to stock up on some wine for the holidays. First stop was Bonking Frog wines to buy some Summer Merlot to make some summer sangria – click here for the website. Then onto lunch at the Moody Cow Brewery, of course cannot drink the beer but they have wine on the menu and gluten free meals. I had tasty pan fried salmon with grilled prawns and the chef made me some hand cut chips – click here for the website. Finally finished off the day with some wine tasting at St Aidan’s and coffee and cake. The Xmas Pudding Baked Cheesecake was delicious and something different to the traditional Xmas Pudding but with all the taste of cinnamon and nutmeg. Picked up some sparkling chardonnay and rose and head home very full and satisifed – click here for the website. Last day of work for 2012 so decided Friday night was pizza night! Been loving Bianco’s gluten free pizza bases with a range of toppings for a quick and inexpensive dinner out with a BYO bottle of Shiraz! I had seen the Facebook post for the Xmas pizza and needed to try it. 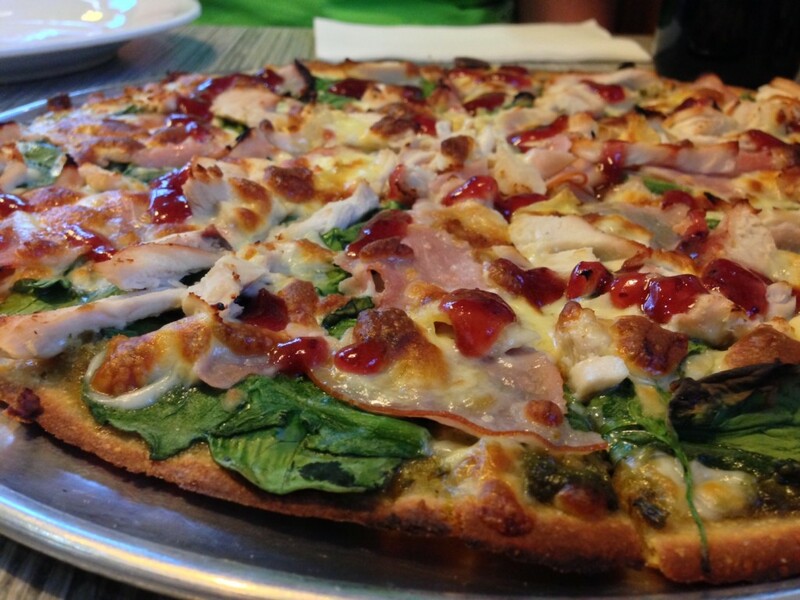 With the ham and chicken on pesto base with some brie and cranberry sauce it was just the right blend of Xmas tastes! Get in and try it before Xmas! I have been over in Melbourne for holiday and work and as we all know eating gluten free can be tricky when travelling and eating out. We stayed at the Jasper Hotel and they had gluten free bread to have with the poached eggs and vego breakfast. The food hall near by in Melbourne Central has a number of gluten free options including Mad Mex, Nando’s and Grill’d. 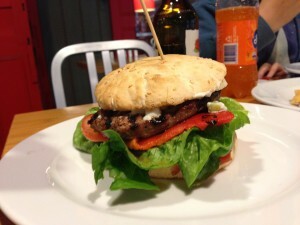 I thought Jus Burgers in WA had the best gluten free burgers and chips but Grill’d is just as good. I had the Moroccan Lamb Burger with the chips that had a herb sprinkle, very tasty. For our final night in Melbourne we went to Taco Bill’s which was tasty but tricky as while website said to ask the wait staff what was gluten free they seemed less than confident in telling what I could eat, I went with the potato skins to be on the safe side! Thanks Cafe 140 for the invite to your “Additions & Alterations” evening, it was a fun night and delicious food. 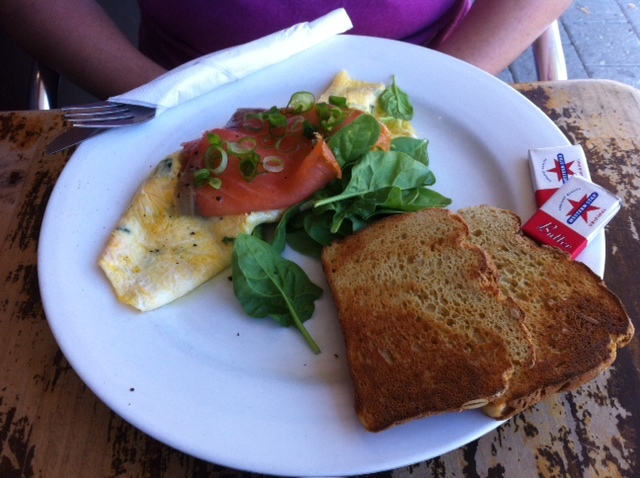 Much on the menu remains gluten free including my favourite smoked salmon and feta omelette. A new breakfast option (or in my humble opinion a tasty lunch!) is the Good Morning Vietnam which is made with sweet chilli sauce rather than soy sauce so is also gluten free. 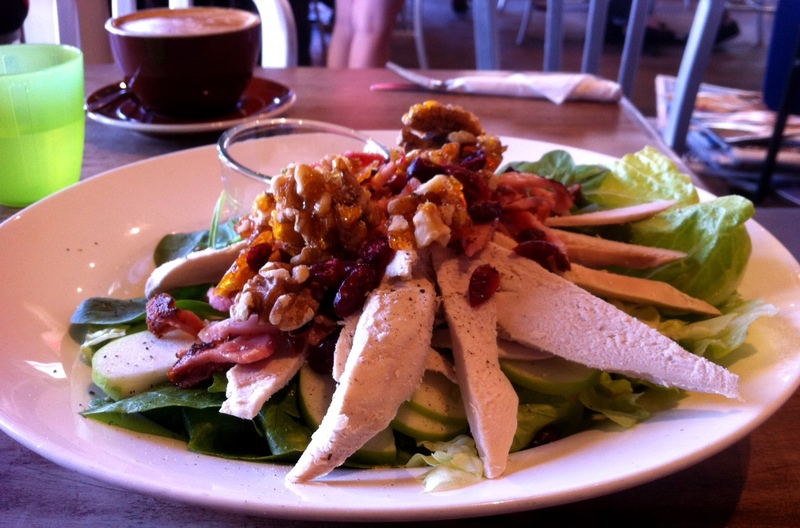 My new favourite lunch is the Chicken Salad with crispy sweet Granny Smith apples, cranberries and candied walnuts with a serve of homemade aoili on the side. The great thing about Cafe 140 is they make everything on the premises and source good quality local produce so the staff can go out and chat to the chef’s to confirm your choice will be gluten free. Don’t be shy just ask! It was a wintery day so on return from taking my Mum home to Collie went to Donnybrook for some lunch and to taste and buy some wine. Decided to try Cafe Tiffany’s on the main road just up from the playground. They had a good selection of savoury and sweet gluten free options for lunch made on the premises from local produce and the owner was able to let me know exactly what was gluten free. 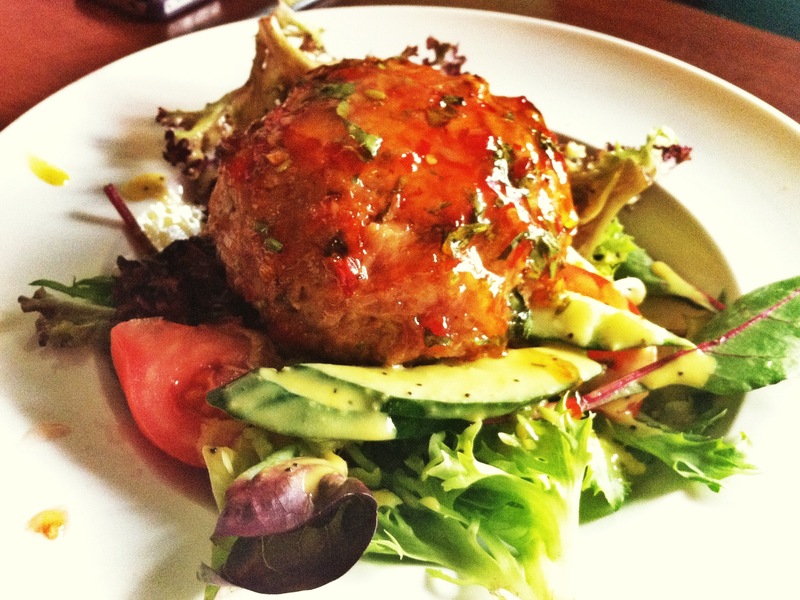 I had the risotto cakes which had a delicious flavour and texture with a side salad. The portion size was just right for lunch and very reasonable prices. 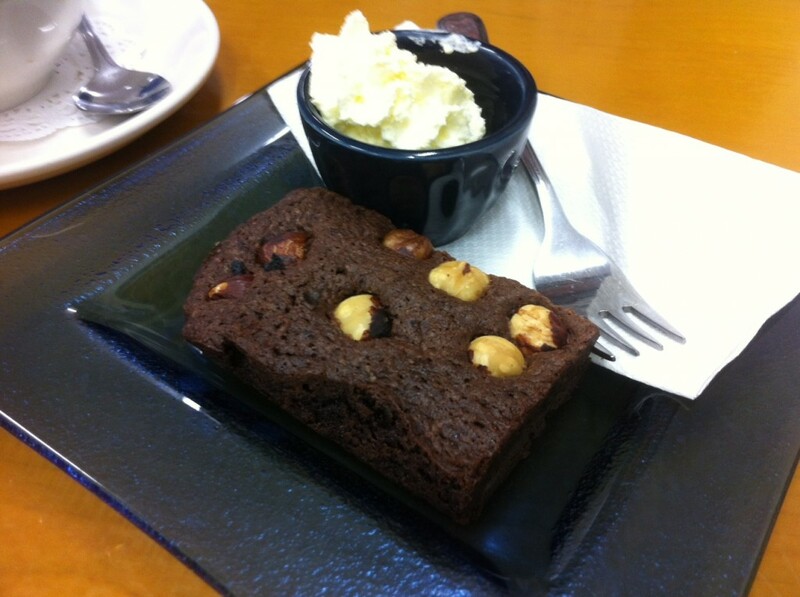 The lunch left me enough room to sample a gluten free chocolate hazelnut brownie which went well with the smooth Five Senses coffee. 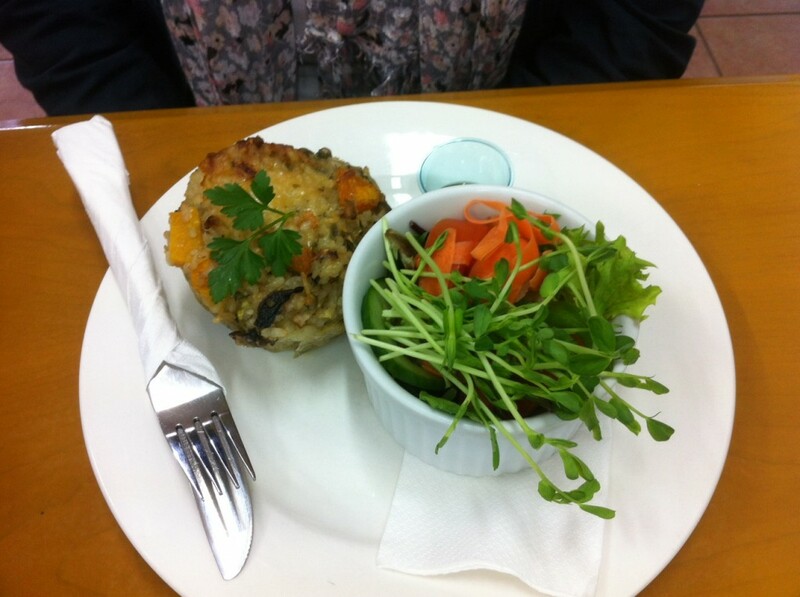 Check out Cafe Tiffany’s next time you are in Donnybrook or visit their Facebook page here. Afterwards it was a trip to Barrecas winery to pick up a case of mixed red wine. We love this family owned and operated winery and often make the trip to buy some great tasting wine at a fantastic price. 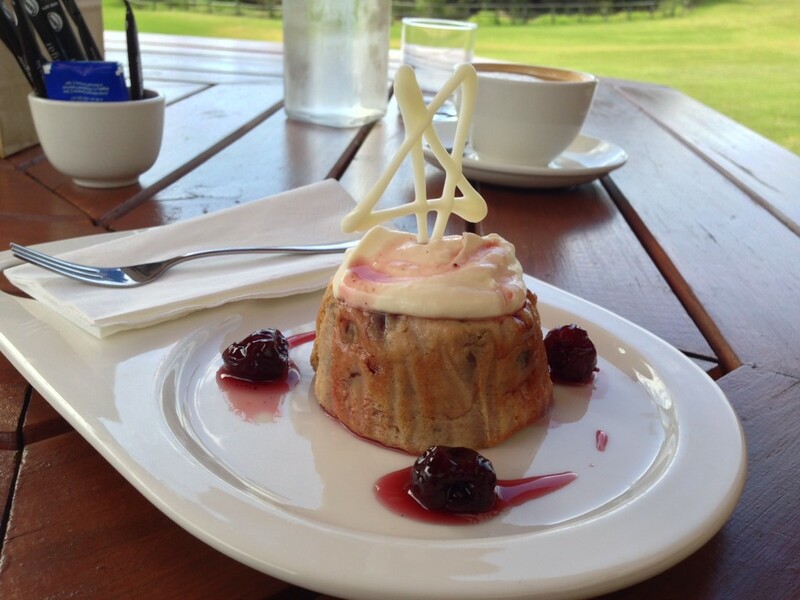 Visit Barrecas on South Western Highway just east of Donnybrook or visit their Facebook page here. I can highly recommend any of the shiraz varieties with the Shiraz Malbec being my favourite. 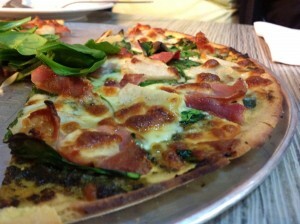 Delicious gluten free pizza at Cafe Bianco on a gluten free base hand made with chickpea flour. This month is Charlotte’s Pearsciutto with a pesto base, topped with baby spinach, slices of pear, salty crisp prosciutto & mozzarella. Go check it out as for April only! Yes I do love Cafe 140! If you have not worked it out by now Cafe 140 is my favourite place for gluten free food and great coffee. They might not have the biggest range of gluten free food on the menu but it is the best and the tastiest from breakfast to sweet treats. The coffee is consistently good and love trying out all the single origin coffee. 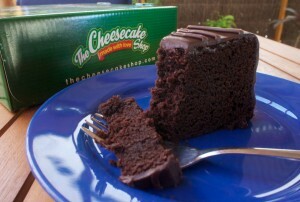 So please vote for Cafe 140 in the I Love Food Awards 2012 here. I visited Albury-Wondonga for a Dru Yoga event on the weekend. Found a lovely cafe called Simply Fed that had lots of gluten free offerings. I had the chicken risotto balls which tasted delicious. Also found a gluten free Mexican called Taco Bill’s that had a separate gluten free menu offered a gluten free tortilla stack. Also had the chance to try Deek’s gluten free quinoa bread, hoping to get this in WA, check out the website here.